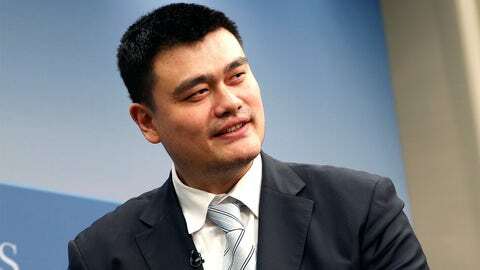 Yao Ming is the face of a new movement in China. Former Houston Rockets All-Star center Yao Ming is one of the more important players in NBA history. He’s the most successful NBA player from China, for starters, and his 7-foot-5 frame and beautiful soft touch made him pretty unique. It’s safe to say we won’t see another player like Yao Ming for quite some time. He’s a rare talent. Perhaps it’s fitting that in his retirement, Yao Ming is doing something we haven’t seen many other athletes do. With the shark population decreasing and becoming endangered, Yao has stepped in to help. "Yao Ming, the eight-time NBA all-star who played for the Houston Rockets from 2002 to 2011, is a conservation all-star in his own right. "Through a partnership with the conservation organization WildAid, Ming has become the face of the movement to end the consumption of shark fins in China. Blowing the popularity of shark fin soup out of the water quickly became Ming’s top priority. "Shark fin soup has been a popular delicacy among the Chinese elite for generations. While shark fins contain little meat, sharks are often sought purely for their expensive fins to fuel demand for soup. Dismembered sharks are often tossed overboard to drown or bleed to death after their fins have been hacked off, decimating populations of sharks and the ecosystems they occupy. "The campaign was launched ahead of the 2008 Beijing Olympics and gathered steam from there. Armed with the slogan ‘When the buying stops, the killing can too,’ ads featuring Ming appeared on Chinese state television 3,250 times in 2013, with further exposure through social media and ads on public transit and in public buildings across China. Other media stars, including Jackie Chan and popular Chinese actress Hai Qing, have taken up the cause as well."